In an industry such as machine vision where new standards and technologies are being launched at an unprecedented rate, emerging trends are multiplying faster than cameras on an automation line. Some trends are inevitable developments that are years in the making, while others are more disruptive, bleeding in from areas unknown. Consider, for example, how the Industrial Internet of Things (IIoT) has fundamentally altered manufacturing, paving the way for companies to achieve new milestones in product quality, cost efficiencies, and greater visibility throughout the enterprise. 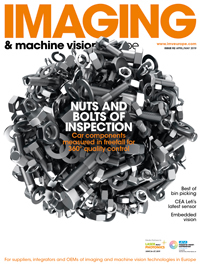 CROSS-INDUSTRY COLLABORATION: Diverse new uses of machine vision components have thrust vision manufacturers into markets where they are encountering interface standards they are not accustomed to, such as HDMI 1.3 in microscopy, SDI in broadcast, 3G-SDI in defense, LVDS in traffic imaging, and GMSL in automobiles. To resolve these differences, all parties will need to collaborate to share expertise on how best to get the data from a camera's sensor to the PC memory for processing. SMART CITIES: As part of the "Smart City" concept, vision systems will be deployed in larger numbers for monitoring traffic patterns, and for recognizing license plates for security purposes. Advanced vision technologies, including connected vehicle technologies, will help to reduce the number of collisions, fatalities, and injuries. The ITS segment will grow at nine percent or more from 2017 to 2025. Because many existing ITS systems are currently analog and therefore outdated, the CoaXPress standard, which uses legacy coaxial networks migrate to digital transmission, will continue to gain traction in this area. VISION-GUIDED RETAIL: Amazon is beta-testing an unattended grocery store on its corporate headquarters that rings up purchases with machine vision-enabling cameras, aided by sensors and RFID tags. It then charges the customer's Amazon account as they walk out. No waiting in lines. Over the next 3-5 years, retailers may flock to this vision technology in the hope is that these "mobile stores" will be the savior of their remaining brick and mortar mainstays. In a recent study, it emerged that over 80% of business was still conducted in brick and mortar, so increasing the efficiency of this is tantamount to a successful shopping experience. COAXPRESS vs. USB3 VISION/GIGE VISION: USB3 is an industry leader in the sub 400MB/S application areas, but for customers looking to get an extra benefit in an upgrade from this, or a significant benefit in an upgrade from GigE Vision, the option is to migrate to a single link CoaXPress solution. With a 600 MB/S data rate and removing all the latency, interrupt , cable and I/O challenges of USB3 and GigE Vision, CXP is poised to become the industry leader in low ban data rate. The low price tags of the hardware in this market is ensuring an easy decision for customers of GigE Vision and USB3 Vision systems. HYPERSPECTRAL ADOPTION: PC-based hyperspectral imaging is used to identify materials, find objects, or detect processes that are not visible to the naked eye. Applications in areas outside of manufacturing are fueling strong growth for hyperspectral cameras, which combine spectroscopy with digital imaging. The military surveillance segment makes up the largest market share of hyperspectral imaging, followed by the environment testing, and mining and mineralogy segments. There is also adoption of hyperspectral imaging in various medical procedures and diagnostics. The relative complexity of analyzing and processing imaging data has acted as a major hindrance to the growth of the market, along with the high cost of hyperspectral cameras. Manufacturers are now poised to overcome these drawbacks. "Our customers are solving vision application challenges in ways that were unthinkable even five years ago," said Donal Waide, Director of Sales for BitFlow, Inc. "Innovation should make 2018 an exciting year for manufacturers and therefore, system integrators and end-users." In 2018, the machine vision industry is expected to grow at ten percent or more. In fact, industry sources are now projecting global sales of machine vision components to reach a staggering USD $19 billion by 2025 or nearly double its current value. Growth will provide the needed funding for new cutting-edge technologies, and for refining current ones.